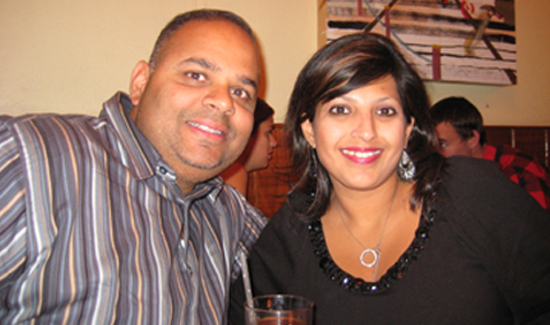 Sam and his wife, Alisha, who has always supported his choice of pursuing a career in law enforcement. – Sam Panchal, from the book Brave Hearts: Extraordinary Stories of Pride, Pain, and Courage by Cynthia Brown. As Sam bounced back from his eight months undercover, he was officially promoted to detective and assigned to one of the NYPD’s most exclusive units, TARU, the Technical Assistance Response Unit. For the next decade he would set up surveillance equipment, bug the offices and homes of mobsters and other criminals, and wire up cars for audio and video. Lieutenant Louis Vozza worked closely with Sam during his stint at TARU. When he got a surveillance assignment, the first thing Sam did was check out the location. He would look for an object where he could insert a camera, an audio or a tracking device. None of this equipment can be bought in stores so once he cased out the location, he went back to his workshop at TARU headquarters, design the equipment himself and then plant it so no one would know it was there. Because Sam was fast, most jobs went off without a hitch. But there were times things got tense. But Sam had always dreamed of being a cop. Like so many people who are drawn to law enforcement, it was more of a calling, a passion, something deep in his soul that drew him to this dangerous and stressful life. “It’s all I ever wanted to do,” he said. When he signed up for the police exam, he was twenty-years-old . He was working as a technician for the phone company and living with his parents. It wasn’t long before his boss realized he had a special knack for electronics and he started to get promotions. But Sam was bored. He kept thinking about the Police Department. Despite being extraordinarily close to his family, Sam never told them what he was doing. For months he hid his uniform in the car and changed his clothes on the way to the academy. He knew his father, who had come to this country with nothing and twenty years later was a senior vice president at MetLife, would never understand his desire to go into law enforcement. All the time Sam was getting trained at the police academy, his parents thought he was still working at the phone company. Finally Sam had to tell the truth. His mother was getting suspicious. She knew something wasn’t right. Once they got over the shock their son was going to be a police officer and would be making only half of what he did at the phone company, they began to worry. Sam said they thought he was going to get killed. His first assignment out of the Academy was the midnight shift at the 43rd Precinct in the South Bronx. For Sam’s parents, that was the worst district they could have put him in. But for the rookie cop, getting assigned to one of the toughest precincts in the city was a dream come true. “I went to work at night and got off duty at eight in the morning,” he said. “Every shift we were out there non-stop. There was crack cocaine, heroin and other drugs. We were called out to a lot of shootings. One of my first nights on patrol, we responded to a call for shots fired. When we got to the location, there was a man lying on the street. I got there just in time to see him take his last breath. Twenty years later, I can still see him, all alone, lying on the sidewalk. 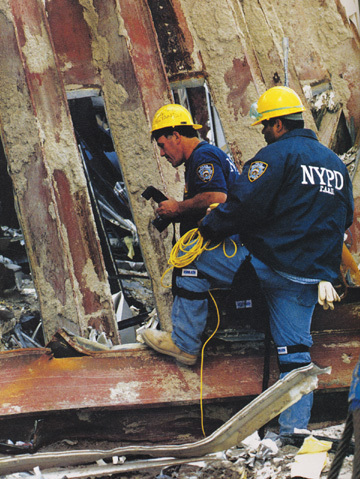 Panchal, right, spent months working at Ground Zero following the attacks of September 11. He’s pictured here with Detective Dave Fitzpatrick two weeks after the attacks. Dave’s extraordinary pictures of the disaster were published in the bestselling book Above Hallowed Ground. But there’s a lot more to police work than the thrill of locking up bad guys. A lot of the work is emotionally devastating and every law enforcement officer in America would agree it’s the calls where kids have been hurt, whether they’ve been in a car crash, injured by parental neglect, or become an innocent victim of violence, that haunt them the most. Everyone who knows Sam Panchal agrees his legacy is secure. For those who had the pleasure of working with him, he is remembered as a guy who always gave one hundred percent, the one who always tried to do his best, the one who always took that extra step. From the pages of Brave Hearts: Extraordinary Stories of Pride, Pain, and Courage by American Police Beat publisher Cynthia Brown, available at www.braveheartsbook.com and on Amazon. Digital editions also available for Kindle and iPad. With over 15,000 copies sold, Brave Hearts is being used as curriculum material in over 40 police academies and colleges of criminal justice.